You are here: Home / Blog / HVAC System / What Causes Spring Allergies? For many people, spring is allergy season, which means they’ll soon have to start dealing with unpleasant allergy symptoms: runny nose, irritated eyes, sneezing and congestion. 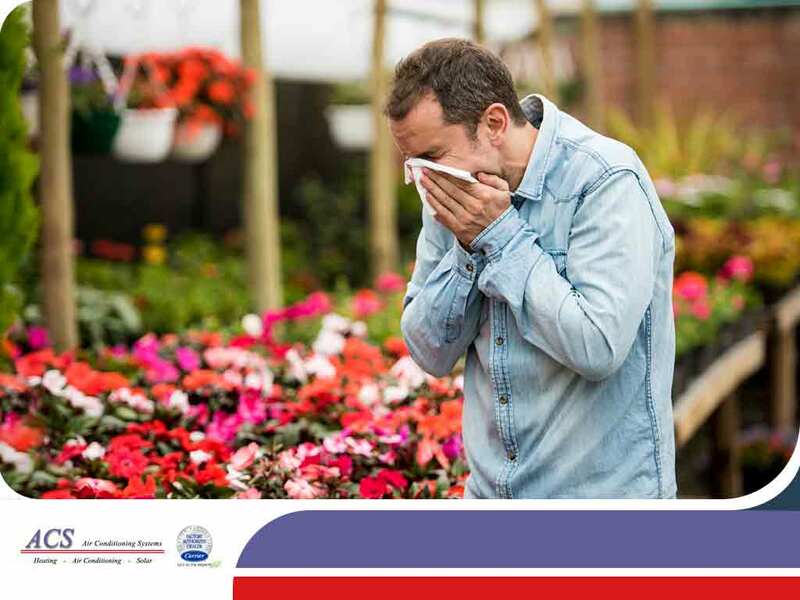 ACS, one of the leading HVAC companies in the Bay area, takes an in-depth look at the common causes of spring allergies. The biggest spring allergy trigger is pollen, which is released by trees, grasses and weeds as part of their reproductive cycle. When such particles reach the nose of someone who’s allergic, the immune system sees them as hostile and releases histamines. These antibodies trigger symptoms such as itchy eyes, a runny nose and sneezing. Pollen tends to stay in the air longer in certain places, which results in prolonged high pollen counts in those areas. The warm temperatures and relatively high moisture levels during the spring season also encourage mold growth, the spores of which some people may be allergic to. Unlike pollen, mold can also originate indoors. Fortunately, there are ways to minimize the effects of these allergens. The first thing you should keep in mind is the importance of maintaining good indoor air quality. Keep the doors and windows closed, and use screens if you have to open them. HVAC companies recommend that you inspect your air conditioner, particularly the air filter, at least once a month in the spring. Air filters work like drain traps; if you don’t clean them out regularly, they’ll quickly get clogged. Controlling indoor humidity helps minimize mold growth; this can be done by integrating a humidifier/dehumidifier into your existing HVAC, which is compatible with most current systems. This will help balance indoor moisture levels. If you can’t avoid going outdoors due to work or other activities, you can at least refrain from bringing pollen into your living areas. This can be done by changing clothes, taking a shower and washing your hair as soon as you get home. Dry your laundry using the clothes dryer instead of hanging them outdoors. Minimize your contact with pets that tend to stay outdoors for long periods of time. ACS is one of the leading HVAC companies in the East Bay Area. If you need an indoor air quality assessment or require help with your HVAC system, give us a call at (925) 676-2103 or fill out our contact form.